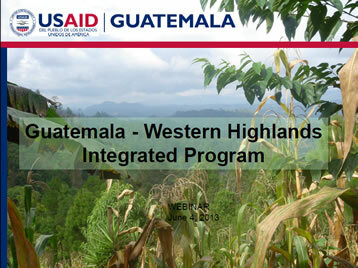 USAID | Guatemala is actively supporting the coordination of development initiatives under Feed the Future, bringing agriculture and nutrition partners together through the newly-created Western Highlands Integrated Program (WHIP). Strategy development, procurement principles, and close partner collaboration are leading principles and actions in the implementation of the program. Supporting partner collaboration and integration at the national and field levels.